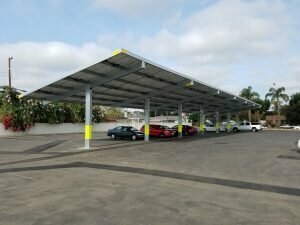 ALISO VIEJO, CA – XsunX, Inc., a leading solar and energy saving technologies provider, today announced that the Company has delivered another state-of-the-art commercial solar carport power system. The latest, an 85-Kilowatt solar carport installation in Garden Grove, California, is coupled with energy demand control technology to deliver the potential of well over $1 million in projected energy savings in just its first 25-years of operation. The project, which was installed for the Garden Grove Seventh Day Adventist Church, coupled an 85kW solar PV carport with energy demand control to reduce energy costs two ways – through solar energy production to power the Church and energy use management to improve how efficiently the Church uses energy. Together, these technologies will significantly reduce the church’s operating costs by about $30,000 in the 1st year alone. Yearly savings will continue to increase while adding to the property’s aesthetics and value.